In this species, figured on Plate 27, bearing somewhat the contour of an Agaric, the spines are all confined to the lower surface of the expanded cap. The general color of the upper surface is buff, generally very pale, occasionally almost white. The spines being of similar hue, this color and the smoothness of texture have suggested the common popular English name of "doeskin mushroom." The flesh is firm and white or creamy, turning brownish when bruised. Its sweet but slightly pungent or peppery taste when raw disappears in cooking. It is quite frequent in our woods, and if fresh and free from insects may be eaten without the slightest hesitation. It is a species highly favored on the Continent, where the surplus yield is habitually dried and kept for winter use. 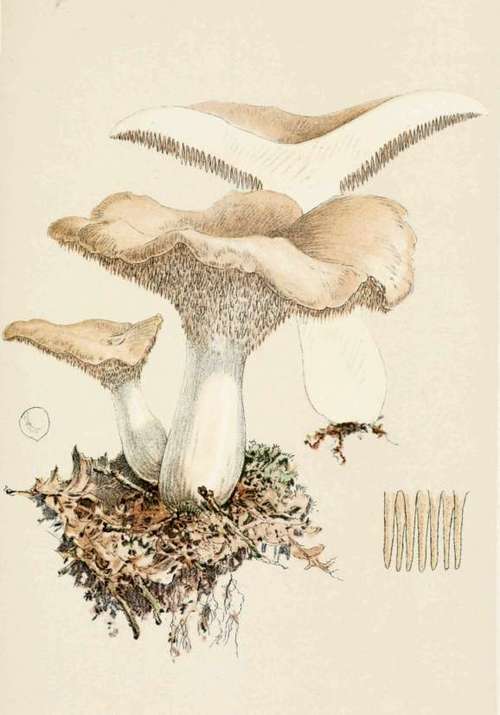 The hot flavor of the raw Hydnum was formerly sufficient to brand it as poisonous, Roques, I believe, having been the first to demonstrate its edibility, and Dr. Badham to distinguish its mimetic flavor - "Hydna as good as oysters, which they somewhat resemble in taste." Cooke and Berkeley describe a variety of this mushroom having a distinctly reddish pileus - Hydnum rufescens - and Prof. Charles Peck gives the species quite a range in its color gamut. "Its color may be pale buff, rusty yellow, pale red, or sienna color." The "pale buff" will doubtless be found to be the most common. In the variety rufescens the size is smaller and the form more symmetrical, but the general shape and fringe-toothed spore surface are sufficient to identify the typical species under any disguise of color. Pileus: Diameter two to five inches, generally irregular, with the stem off centre. Color varying from pale buff, the typical hue, to a distinct bricky red. Spines: Beneath the cap, one-quarter to one-third inch in length; soft, creamy in tint, becoming darker in old specimens. Stem: Often set eccentrically into the cap; proportionately thick and short. Habitat: Woods or shaded places in rich soil, often in clusters. 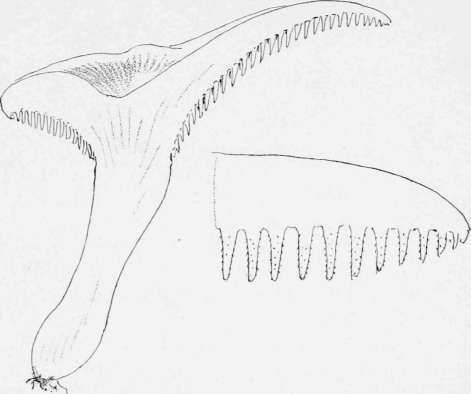 The cap is occasionally quite symmetrical, suggesting the outline of a Boletus in profile, but more commonly is irregular and eccentric, with stem attached towards its side, as indicated in section on previous page. It may reach the diameter of five inches in a fine specimen. Its favorite haunt is the open woods, where it may be seen from the last of June until September, either singly or in clusters, lifting the dried leaves from their bed, or occasionally barely revealed beneath them.